This is a Civil Defense Hurricane Norman update for 5 p.m., Wednesday, September 5, 2018. The Central Pacific Hurricane Center reports that as of 5:00 pm, Hurricane Norman is a Category 3 hurricane, 385 miles E of Hilo with sustained winds of 120 mph, moving West North West at 9 mph. The National Weather Service reports that a High Surf Warning has been issued for the north and east facing shores of Hawaii Island, from South Point to Upolu Point. Winds may also increase in localized areas today. At this time Richardson Beach Park and Kealoha Beach parks have been closed due to high surf conditions. All other beach parks on the north and east side of the island, from South Point to Upolu Point will be closed tomorrow. All permits and reservations for these parks have been canceled. Oceanfront residents are urged to be on alert for high and dangerous surf conditions through tonight and tomorrow. Do complete your preparations before nightfall. Civil Defense is monitoring the storm and will keep you informed of any changes that may affect your safety. Do take this time to assure that emergency plans are updated. At 5 p.m. HST (0300 UTC), the center of Hurricane Norman was located near latitude 20.0 North, longitude 149.2 West. 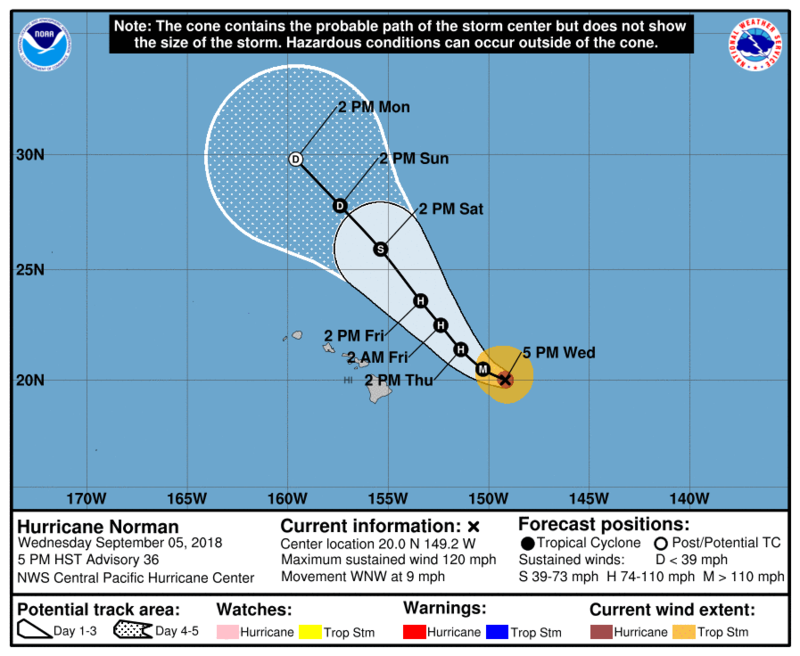 Norman is moving toward the west-northwest near 9 mph (15 km/h) This motion is expected to continue tonight, followed by a northwestward motion on Thursday and Friday. 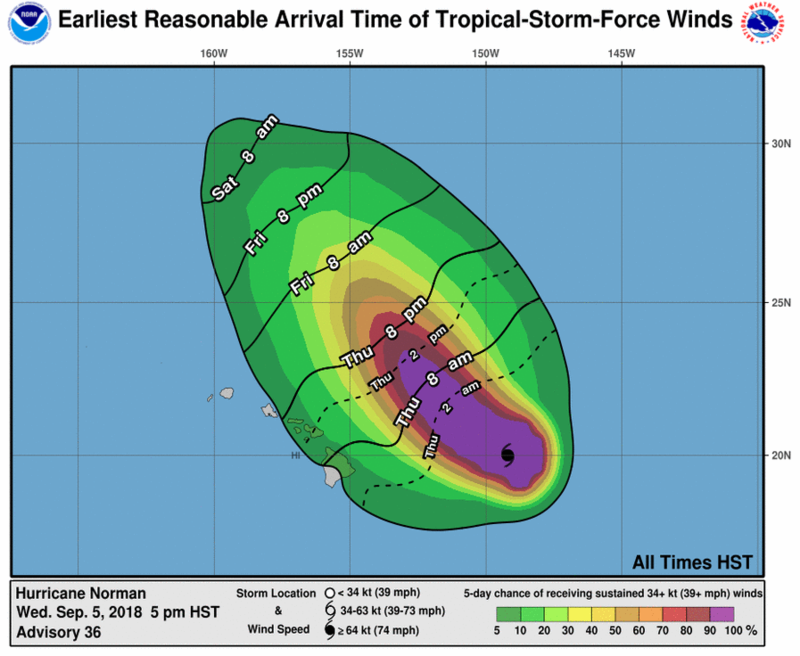 On the forecast track, the center of Norman will pass 200 to 300 miles to the northeast of the main Hawaiian Islands on Thursday and Friday. Maximum sustained winds are near 120 mph (195 km/h) with higher gusts. Norman is a category 3 hurricane on the Saffir-Simpson Hurricane Wind Scale. Some weakening is forecast during the next 48 hours, although Norman is expected to remain a hurricane through Friday. Hurricane-force winds extend outward up to 30 miles (45 km) from the center and tropical-storm-force winds extend outward up to 115 miles (185 km). The estimated minimum central pressure is 960 mb (28.35 inches). SURF: A large swell from Hurricane Norman will continue to rise, and peak Thursday, along east facing shores of Hawaii Island, Maui, Molokai, Oahu, and Kauai. The Federal government is the only way to buy flood insurance. Visit www.floodsmart.gov for more info. For the Central Pacific Ocean a Hurricane/Tropical Storm Watch means hurricane/tropical storm conditions are possible in the specified area of the Watch, usually within 48 hours. Fuel and service family vehicles. Prepare to cover all windows and door openings with boards, shutters or other shielding materials. Check food and water supplies. Have clean, air-tight containers on hand to store at least two weeks of drinking water (14 gallons per person), and stock up on canned provisions. Keep a small cooler with frozen gel packs handy for packing refrigerated items. Check prescription medicines – obtain at least 10-14 day supply. 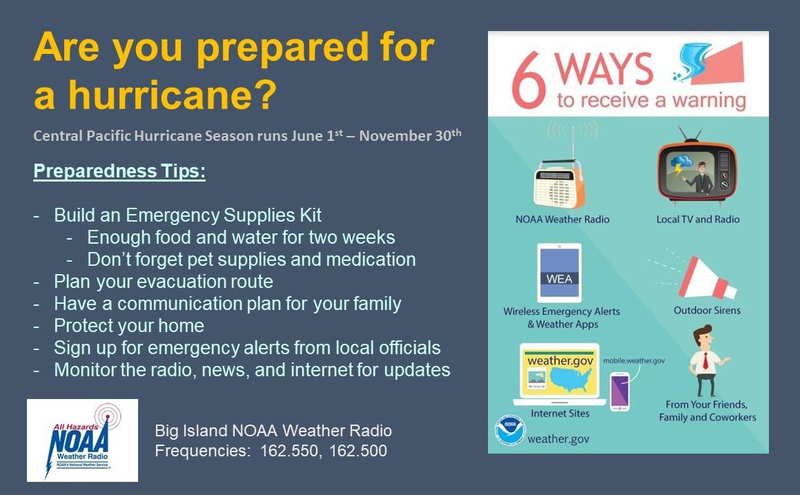 Stock up on extra batteries for radios, flashlights, and lanterns. Store and secure outdoor lawn furniture and other loose, lightweight objects, such as garbage cans and garden tools. Check and replenish first-aid supplies. Have on hand an extra supply of cash. Read the Hawaii Boater’s Hurricane and Tsunami Safety Manual for recommended precautions to protect your boat prior to a storm. For the Central Pacific Ocean a Hurricane/Tropical Storm Warning means hurricane/tropical storm conditions are expected in the specified area of the Warning, usually within 36 hours. Follow instructions issued by civil defense. Leave immediately if ordered to do so. Complete preparation activities, such as boarding up windows and storing loose objects. Evacuate areas that might be affected by storm surge flooding. If evacuating, leave early. Notify neighbors and a family member outside of the warned area of your evacuation plans. The Central Pacific Hurricane Center (CPHC) issues tropical cyclone warnings, watches, advisories, discussions, and statements for all tropical cyclones in the Central Pacific from 140 Degrees West Longitude to the International Dateline. The season officially begins on June 1 and ends on November 30. However, tropical cyclones can occur at any time. The National Weather Service Forecast Office in Honolulu activates the CPHC when: (1) a tropical cyclone moves into the Central Pacific from the Eastern Pacific, (2) a tropical cyclone forms in the Central Pacific, or (3) a tropical cyclone moves into the Central Pacific from the West.